In the late afternoon, I taped my scene, which consisted of standing at a pay phone and making a call. I was to ask for a girl, and then nod while I was told she was unavailable. Then I was to hang up and gaze at an apartment window, which was, presumably, hers. My delivery needed work, and it took several takes. Eventually, the crew was satisfied enough to declare victory and hand over my lines for the following day. It was then that I discovered that I would be playing a sexual predator. He ultimately decided to pull out from the gig, ticking off the producers. My own non-experience with a Chinese TV production was pretty similar. 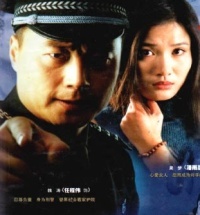 In 2001 or 2002, when I was teaching at the Northeast Institute of Electric Power in Jilin City, I was invited to appear as a lecherous foreigner in three scenes of a crime drama. Filmed on location in the city, it would focus on the exploits of northeastern mobsters and the police hot on their track. It would be broadcast on local TV, so I’d be seen by all my students. A middle-aged colleague of mine was cast as a foreign bartender in one scene. The character I was to play was part of a trap set by local mobsters, whose boss had wormed his way into a job with the city police. I was to be bait in an attempt to gain evidence to blackmail the heroine, who had gone on the lam for reasons I can no longer recall. Before they confirmed my participation, they made sure that I was comfortable with appearing shirtless in one scene: the police would burst into my hotel room and arrest me for soliciting a prostitute, and I would have to dress for the occasion. Decency is a fluid thing — I’d already adjusted my suburban American attitude to the Speedos of Jilin’s public pools and the dress shoes of its mountain pathways — so I decided I didn’t have a problem. Then the script came. It turned out that my dodgy foreigner would first appear in an elevator casting a lustful eye upon the heroine. Later he would come on to her and react with pervy delight when she claimed to be a college student. That was the deal breaker. Due partly to the conduct codes handed out every year while I was an undergrad, and partly to the stereotype that foreign teachers were only in China to score, student-teacher relationships were off-limits as far as I was concerned. I didn’t want to give anyone the wrong impression in a prime-time soap. My colleague also decided to back out. The casting director was not pleased. He tried to persuade us to reconsider: “It’s just acting.” “We can erase the college student line.” “It’s going to premiere in Yunnan, and it won’t even show in this city.” Eventually he gave up and went to the other big university across town, where he found two other foreign teachers to fill the roles. The program did end up on Jilin TV, and everyone had fun identifying where everything was shot. The scenes in question came off pretty much as you’d expect, if you’ve ever seen foreign non-actors playing bit parts on Chinese TV. The only thing I really remember about the show is a scene where a police officer eating hotpot out on the street is taunted by a mobster and for some reason has retrieve his gun from the hotpot dish. By the time he screws up enough courage to dip his hand into the boiling water, the mobster has already turned a corner. I wouldn’t have minded playing a role like that. This entry was posted on Thursday, July 15th, 2010 at 3:20 pm and is filed under Uncategorized. You can follow any responses to this entry through the RSS 2.0 feed. You can skip to the end and leave a response. Pinging is currently not allowed. jdm as shirtless lech — I’d have gone out and bought a tv for that! btw, any chance you’d add the “subscribe to comments” plugin sometime? I could have graduated to playing fully-clothed pervs in subsequent shows, I’m sure. I’m not aware of that plugin. Does it offer any advantages over the standard “comments (RSS)” and feed for this entry?